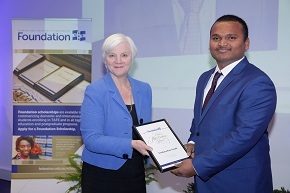 The Federation University Australia Foundation had pleasure in awarding the Kiran Mazumdar-Shaw scholarship for 2018 on Thursday 3 May 2018 to Venkata Rao Gondi. Venkata also received entry into the Golden Key International Honours Society in 2018. From left: Jessie Harman, and Venkata Rao Gondi, 2018 Kiran Mazumdar-Shaw scholarship recipient.